Technology is always advancing as the digital age keeps growing and expanding. The internet has also advanced; a once seldom usage to for privileged and that has become something that’s accessible to all across the globe, despite wealth, ethnicity, or country of origin. With rise of the internet and its age of endless information at a person’s fingertips, so too has the rise of social media through various outlets (i.e. Facebook, Instagram, Twitter, Google +, etc.). These social media platforms have become a popular trend with the current generation of internet users (be it young or old) and does have many pros for their usage. However, there’s always the “flip slide” to common trends, seeing the internet as a place where predators and hackers dwell and pretty on the innocent and naïve. Even social media has its pitfalls, with most notably in its cyber-bullying. To make matters worse, the recent accusations (famously made by Snowden and others like him) of the US government hacking into their citizens’ technology to spy on them has also put a troublesome doubt in technology and the internet, creating a unsure feeling within a person’s digital footprint. Now, STX Entertainment and Europa Corp and director James Ponsoldt presents a new agreement in this digital age of social media and technology with the film The Circle, based on the book of the same name by writer Dave Eggers. Does this movie shine a light on consequences of the internet, social media, and technology or is it hollow cautionary tale? Mae Holland (Emma Watson) is a young woman who is living a meekly existence, stuck in a dead-end job as a customer service representative. In addition to her unsatisfying job position, Mae’s parents are in a tight spot financially as they struggle to pay for medical treatments for her father Vinnie (Bill Paxton) that the insurance won’t cover. Luckily, Mae’s desire for changes comes about, thanks to her friend Annie (Karen Gillian), landing her an interview with The Circle, a high-profile technology powerhouse company who is trying to change the status quo of the digital age. Mae gets the job and begins to work at The Circle, working as a customer service experience representative, while she acclimates herself to the Company’s campus and its lifestyle. Proving her worthy to the company to its co-founders Eamon Bailey (Tom Hanks) and Tom Stenton (Patton Oswalt), Mae becomes a rising star within The Circle, feeling connected community and embracing the company ideology of surveillance and social media submission. Unfortunately, this draws resentment from Annie, ire from her longtime friend Mercer (Ellar Coltrane), and a growing concern from Ty Lafitte (John Boyega), a fellow employee who has developed a cynical outlook for The Circle’s prospects. Ultimately, Mae just decide on which side of the debate she falls on as she soon discovers that The Circle is not what it seems to be. This is a very interesting topic to talk and discuss with peers, friends and colleagues (i.e. advancing technology and the rise of the internet social media platforms). Yes, I listed a lot of negative points to be made about the topic in the paragraph above, but there are plenty of positives, including the ability to write and share my viewpoints of movies with my blog. Social media has also giving me the chance to stay connected with old friends, make new ones, and to collect / share information across the globe. So, it’s not a completely bleak or taboo experience to have on the internet and on social media. Its merely on how a person navigates through him and represents themselves “online” is the problem, with millions of individuals who are totally consumed by their online presence, living a secondary life on the internet and sometimes get caught up within some “sticky” situations that their peers and / or colleagues project via these social media outlets. So, it’s pretty much good and bad together as each person has a different viewpoint on the topic. This, of course, leads me to talking about my review of the movie The Circle. I remembering the film’s trailers several times when I go to my local movie theater and (working at a bookstore), I kept on seeing many people buy Dave Eggers book. Plus, the recognizable cast of the movie peaked my interest to see the movie when it got released, purchasing a ticket on its opening night. What did I think of it? Well, to be honest I’m very conflicted about this movie. Despite a familiar cast of actors and an intriguing premise of a utopian society (sacrificing freedom and privacy for security and information), The Circle flounders under several crucial areas, making the feature very contrive, befuddling, and stale in its representation. Given its source material being a bestselling book and its narrative social commentary talking points, it’s truly a disappointing shame that movie misses its mark. The Circle is directed by James Ponsoldt, whose previous directorial works includes the films Off the Black, Smashed, and The Spectacular Now. Before I forget, I didn’t read Eggers’s novel, so I can’t compare “apples to apples” between page to screen. Thus, my review is mainly going to be about representation of the film and no so much what was added, removed, or omitted. Ponsoldt toys with the idea that The Circle is a kind of “big brother” company, utilizing surveillance and no privacy as its main mantra within its community of users. This, of course, invokes a sense of 1984 vibe, but hitting closer to home with a modern age setting. Additionally, in terms of filmmaking, The Circle is presented well. Through its costumes, set layouts, and editing, the film is well-crafted, especially the scenes that show-off the high-tech, modern community of The Circle’s campus. What part I like, which was sort expected, is the stark contrast between Mae’s old home to the sleek design of The Circle campus, the visual representation of the two opposing worlds (i.e the past / present and the future). Additionally, the film’s score, composed by Danny Elfman, is pretty good, aiding to some of the more tender and / or dramatic moments of the feature. Perhaps the biggest presentation of the film as well as Eggers’s novel (I assume) is in the social commentary message that The Circle talks about. Naturally, its speaks volumes to us living in the modern “digital” age, where many are consumed by the life on the internet and / or all the various social media outlets. In addition, it’s always a good topic for discussion / debate on the fundamentals of safety over freedom and security, which is the basis of The Circle’s organization and what they are trying to implicate on a global scale. Whatever many may think of this movie, it’s a topic point that’s worth discussing, especially since advancement in technology as well as the recent accusations of the US government involvement of spying on its citizens. Unfortunately, The Circle, despite its noblest intentions of engaging viewers in its story as well as the fundamental questions it poises, is riddled with problems, making the feature falter greatly from what it wants to be. Where to begin? Well, let’s start with the narrative structure. While I do praise the Eggers’s story, the film’s script, which was penned by Eggers as well as Ponsoldt, is the very definition of a mixed bag. The movie’s first act is probably the best part of the film, setting up the character of Mae and building up the world of The Circle as the somewhat “ultimate utopian dream” community, but then it just starts to fall apart towards the end of the first act (and continues to do so during the rest of the film). Ponsoldt keeps the film moving at a brisk pace, clocking in at around one hour and fifty minutes, is that it never stops to ponder and / or soak up certain events and its characters. Of course, this makes the movie feel fast, but it comprises its storytelling, causing The Circle feel like a series of plot points for Mae to follow, especially during the second and third act of the film. Coinciding with that is that Ponsoldt never full explores Eggers’ world and its ideology involving The Circle as much as was to be expected. An example of this is with a program that The Circle runs called TruYou (or TruU or TrueU or TrueYou…the movie never says how its spelled). What is it? I really mean it…what is it as the movie never explains what it is. All I know is that it a part of The Circle company. I assume it’s a sort of pre-cursor social media program that The Circle first implemented as its tied to one of the main characters, but the movie never fully explains what it is. The same can be said with the whole Circle company. They act like a future high-tech Goggle-esque / Facebook community, but acting way beyond the boundaries that any national government body would allow an industry company. It would’ve benefit the movie if Ponsoldt helped define The Circle better, citing more positives and clearly defining what certain people do (and their job roles) rather than a big social media corporation. In short, the film’s main narrative is way too overstuffed and doesn’t take the time to explain all the “whithertos and whyfors” within Egger’s work. Adding to that, Ponsoldt (as well as the flimsy script) is a little bit “on the nose” when it comes to making The Circle organization as the nefarious company. Right from the get-go, viewers are introduced to The Circle community are clearly bombarded with highly dubious and questionable ideas, rules, and regulations that are presented to Mae, who just simply goes along with it. It would’ve been better if Ponsoldt created a stronger shroud of ambiguity with The Circle’s company ideology and their arguments rather than a “black and white” representation we get in the movie, which seems a bit cartoony (if you stop and think about it). This, of course, makes the movie feels really bland and stale, following a very formulaic and predictable path, with an ending that many can see coming before it happens. Even the subject matter of “private vs. public” (a very strong debatable question for discussion) has been done many times before as The Circle doesn’t really bring anything new to the table …. just reconfirms what’s already been said and done. Even the comic book / superhero film world as already tackle this (see Captain America: The Winter Soldier). The cast in The Circle is one of the big-selling points of the film, with collective group of well-recognizable faces from its main actors and actresses. At the center of the movie is the character of Mae Holland, who is played actress Emma Watson. Watson, made famous for playing Hermione Granger in the Harry Potter films as well as recently playing Belle in Disney’s live-action remake of Beauty and the Beast, does a fairly good job in the film’s lead role, anchoring the story as a fish-out-of-water (or “guppy”) as Mae’s wide-eyed wonderment gets quickly swept up into The Circle’s world and mantra. Unfortunately, her character arc is bit messy at times (due to the runtime constraint on the feature), which sort of rushes through moments that could’ve been more clearly defined for Mae’s personal journey of doubt and self-discovery within The Circle, but that’s mainly due to the film’s script / direction and not from Watson’s performance. While it may not beat out her portrayals of Hermione or Belle, Watson does good solid work as Mae in a somewhat relatable protagonist role. Behind Watson, in terms of star power, is actor Tom Hanks, as The Circle head and co-founder Eamon Bailey. Hanks, known for his roles in Apollo 13, Saving Private Ryan, Cast Away, and Philadelphia, is the real star of the feature, displaying his natural charm and acting talents into the character of Eamon, channeling a persona that similar to Steve Jobs. While he may only be in a handful of scenes (and not exactly fleshed out completely), Hanks’s Eamon Bailey is arguably ones of the best part The Circle. And, if that’s the case, that doesn’t sound good for the movie in general. The rest of The Circle’s cast are the supporting players in the movie and, while played by talented and recognizable faces, their pretty much hit or miss and / or underdeveloped in their respective character, arcs. Perhaps the best example of that comes across the character of Ty Lafitte, who is played by actor John Boyega. Essentially only in three scenes (with a few additional facial expressions during some scenes), Boyega, recognizable from Star Wars: The Force Awakens, is given very little to do with his character. 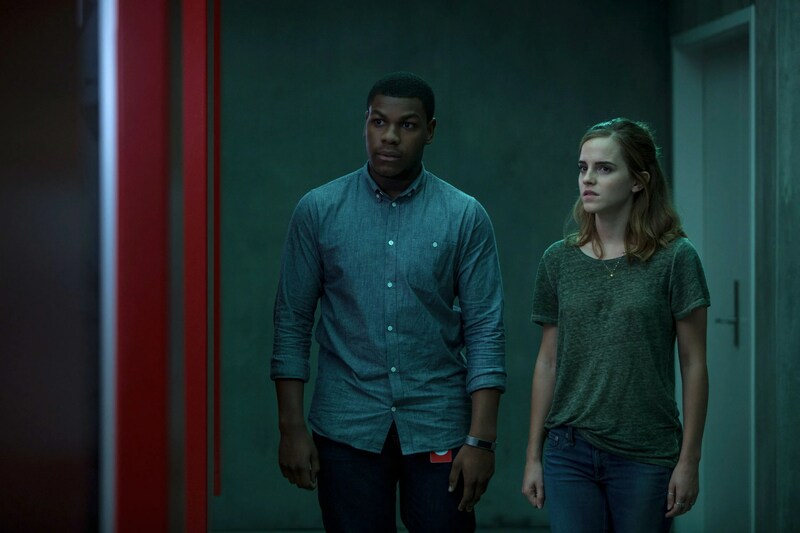 Boyega acting is solid, but, given the script involvement of his character of Ty, doesn’t make lasting impression, only voicing concern and dangers to Watson’s Mae about The Circle. Boyhood star Ellar Coltrane, who plays Mae’s friend Mercer, fares even worse than Boyega’s character, as he’s only stock-like character for several reasons (for both a simplistic “off the grid” opinion way of life for the story and a love interest for Mae). To be honest, the love interest between Mae and Mercer is feigned and not well-though out as it would’ve been beneficial for their relationship to be more developed, which, in contrast, would’ve carried more weigh towards both of the character arcs and distant throughout the film. Likewise, the same goes for actress Karen Gillian, who plays Annie Allerton. Gillian, known for his role in the TV show Doctor Who and most recently in Guardians of the Galaxy, does a fine job in acting out the character of Annie, but (again) there’s not much material given to her to play around, portraying Annie as a workaholic individual who starts to resent Mae’s rising within The Circle. Perhaps who fares the best (beyond Hanks and Watson) are actress Glenne Headly and the late actor Bill Paxton as Mae’s parents Bonnie and Vinnie Holland. Essentially, this pair is emotional heart of the story, portraying a better emotion weight rather than the Mae / Mercer relationship. Plus, it’s sort of sad to see that Bill Paxton in this movie and knowing that he’s no longer with us. With the exception of the TV show Training Day, this was Paxton’s last performance he ever did. As a side-note, comedian actor Patton Oswalt plays The Circle’s other co-founder Tom Stenton and does a good job in this small role (I do like Oswalt in any role he does). As a finale note, forgot to mention it above, the film’s ending is sort of ambiguous, leaving it open-ended for interoperation, but (to me) it just feels inconclusive to a very interesting, but rushed story premise. Knowing is good. Knowing everything is better” is the tagline and the fundamental question asked in the film The Circle. Based on David Egger’s book, director James Ponsoldt’s newest movie definitely has interesting layout and its bolstered by its star-power cast as well as also posing some discussion questions about the “internet age” and the dependency of social media. Unfortunately, the movie flounders under the weight of a multitude of problems from its swift narrative pacing, to its overstuffed story plotting, to its weak dialogue, to uninteresting characters (and their development), and ultimately bringing nothing new to the age-old question of technology vs. security / freedom. Personally, I’m a bit conflicted about this movie (a bit of conundrum). I sort of thought it was okay as it had an interesting story premise, but I can’t ignore all the negative points in the film. Thus, I would have to say that skipping it is the best choice. To those who were taking by the film’s marketing campaign and attraction to its recognizable cast, you can wait for it on TV in few years or just read Eggers book instead (I wish someone gave me that piece of advice instead of seeing the movie). While The Circle tries to be a cautionary tale for our addiction with technology, the internet, and social media, the truth of the matter is that The Circle (the movie) should be a cautionary tale on how not to make a movie; a prime example of taking something interesting and making it into a hollow motion picture. 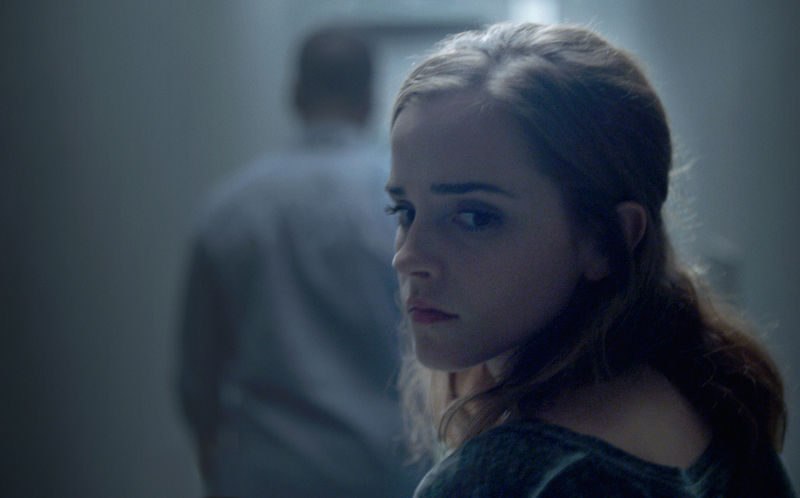 In short, just like Emma Watson’s character says, The Circle is just “unfulfilled potential”. The film got my interest because of some of the well know cast such as Tom Hanks, Emma Watson and John Boyega. I believe the film has an interesting story about the digital world we live in, but it was poorly executed because movies about technology or internet were often unsuccessful. I can’t list any successful movies that is about technology from the top of my head except “The Social Network”. I know there are more out there, but they are not as popular. Great review and a thorough analysis, thank you. However, IMO the masses are being overly harsh with this film. It has obvious flaws and its understandable that the masses hate being mocked for their sheep-like dependence on digital technology. It has strong Orwellian allusions and its warnings are entirely accurate in the current world of news manipulation. I stayed engaged right up to its floppy finale, but its warnings are deadly accurate.